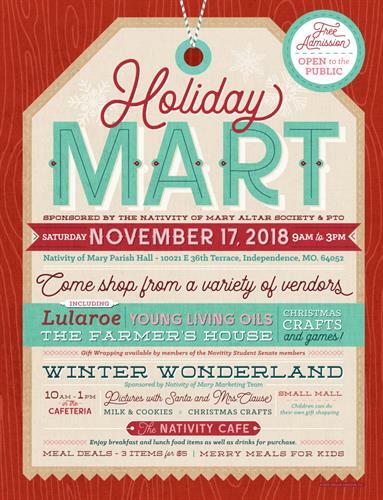 Sponsored by Nativity of Mary's Altar Society & School PTO, Nativity's Holiday Mart will sure be one you don't want to miss! Come shop from a variety of vendors including LuLaRoe, Young Living Oils, The Farmer's House, Christmas Crafts, and much more. Children can do their own gift shopping at Small Mall, take pictures with Santa AND Mrs. Clause, enjoy cookies & milk, and do Christmas Crafts at our Winter Wonderland. The Nativity Cafe will offer breakfast and lunch food items. This day is Free and Open to the public. Spread the word and do all your Holiday Shopping at Nativity's Holiday Mart this year!